My Anti-Valentine’s Day post featured a Dorie Greenspan cake that was flavoured with chocolate, prunes and Armagnac, a combination of flavours that I’m currently in love with. Since I like that trio so much I decided to rework them into a new dessert. 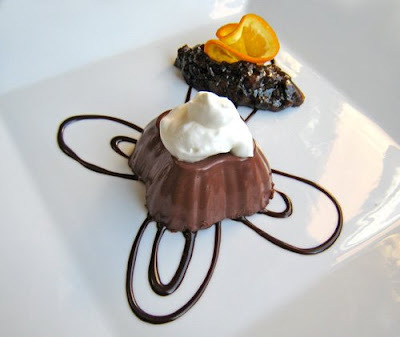 A friend of mine had recently been to a chocolate workshop and one of the recipes that was demonstrated was a chocolate gelée, made with agar agar. 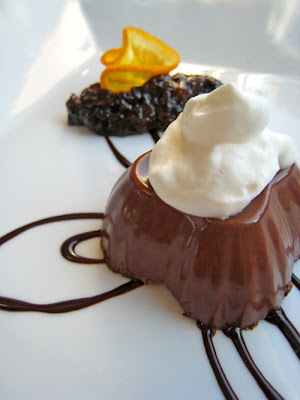 I’ve been playing around with agar lately so he forwarded me the recipe to try. I’ve had mixed results with agar, (I think mainly due to not using proper ratios of liquid to agar) but was fairly pleased with how the chocolate gelée turned out. I knew it couldn’t be served alone though because although it was good, it wasn’t memorable on its own and needed some other textures and tastes to make it complete. And that’s where the prune and Armagnac came into play. I made a simple prune and Armagnac compote, as well as candied some orange slices and whipped some cream with which to garnish the gelée. All of that was easy enough to do, then came the hard part: plating. I’m working on coming up with more interesting plating presentations for my desserts and this is resulting in much frustration. I must have plated this one about half a dozen times before finally photographing it. I still don’t quite like how it turned out visually, but at that point I didn’t want to look at it anymore, (or have to clean my only square white plate again so that I could keep using it in the pictures). Like with this dessert, some things need to be reworked not because they’re necessarily bad to begin with but because the innocent, (or guilty) parties involved need protecting. As I’ve mentioned before, I like for people to tell me stories and will often just ask for whoever I’m with to tell me one. This has resulted in some blank stares but also some pretty interesting tales. I think I could write a book of other people’s stories with some of the gems I’ve received. The unfortunate part is that I’m not always at liberty to repeat what I’ve been told. I almost have to preface my stories with one of those warnings that names have been changed. I think in most cases I’d have to change more than just names or else some people would be getting into trouble. So although I’ve got lots of stories I’d like to tell, I really can’t. But I shouldn’t leave you without at least a bit of a story, right? Right. So there was this one time in Vegas… ah, I can’t tell you that, what happens in Vegas, stays in Vegas. Well what about a story that involves a group of people that liked to secretly get together… hmmm, I think there were rules to that one too, something along the lines of, the first rule of Fight Club is - you do not talk about Fight Club. The second rule of Fight Club is - you DO NOT talk about Fight Club. All these rules are making it awfully hard for me to tell you stories. How about one from my University days? Those are always fun. In first year of university, I lived in a dorm and, like many others, had a roommate. I was fortunate to be matched up with a wonderful roommate who I became best friends with. Not everyone was so lucky. Living in such close quarters with someone you don’t get along with can be a struggle. Over the course of a year, people can start to do some pretty weird things to help them cope with an awkward living situation. I witnessed a whole range of behaviours, ranging from people eating their roommate’s food and drinking their alcohol, (both of which were later denied) to hiding their belongings, (including important ones like alarm clocks and textbooks) to dressing up in their roommates skating outfits and taking pictures with friends. And then getting their friends to dress up in the outfits as well… This usually occurred after the roommate’s alcohol had been consumed. Somehow that person never found out. Now it’s your turn: Tell me a story! Posted by Brilynn at 10:49 p.m. I love telling stories! And hearing them too, of course. Let's see...I'll tell one of my favorite anecdotes about my mom. When I was in high school, my mom came into my room with a pair of jeans and asked if they were mine because my brother and sister were growing so fast she was having trouble telling whose clothes were whose when she did the laundry. I said yes, and my mother whipped out a permanent marker. 'What are you doing?' I asked. 'Well, the people who take off my pants,' I joked. My mom looked at me straight in the eye. Honestly, the plating is pretty good! I'm just getting seriously into plating myself, but I've always found that for a round (ish) dessert on a square plate, a few strong straight lines works best. Just a thought. I was in a craft store with my mom, running up and down the fabric aisle, talking about how I wanted to be a princess when I grew up. I don't know if my mom was just tired of me saying so, or wanted to bring me back to reality or what, but she said, "Oh honey, you don't want to be a princess. Princesses have to live in big drafty castles with no indoor plumbing or central heating." And it worked. I am not a princess. I also love prunes and armangac - the chocolate is a nice touch but even just the first two ingredients can make a wonderful indulgence! Great dessert creation! And a great story too!! I wish I had a good story to tell, but my mind is blank! Sorry!